Are you interested in showing exhibition cavies? This guide will give you a brief overview of what's involved. You must be a member to show in the exhibition section. The cavy shown doesn’t have to be bred by yourself. It is quite common and encouraged to show cavies bred by other breeders. It also gives you the opportunity to practice with your new show cavy before taking the leap into breeding. To explore this side of the fancy it is best to come down to a show (its free). Watch the judging and check out the cavies on display. Talk to our members - they are more than happy to share their knowledge. In exhibition cavy showing each cavy is judged to a standard. In Australia we use the ANCC Standard. A standard describes what a perfect specimen of each breed look﻿s like, gives you an idea on what to strive for and how its judged. Every breed has its pros and cons. Things to consider include; are you prepared to wait three months to see whether the babies are show worthy or do you want to know at birth. Do you want a potential showie in every litter or are you patient enough to breed many litters before you get your showie. Do you like any colour breeds or is all one colour ok. Short show life or long show life? These are all questions to ask yourself. You also have to look into whats available to you. Some breeds may not be available in your state and you may have to freight some from another state. Some breeds may have long waiting lists too. Patience is the key, find out who is doing well with your chosen breed and ask them to keep you in mind for a trio. A trio (one male and 2 females) is generally where to start. You will not find your first show cavy by trawling the for sales at shows. You have to approach a breeder and put yourself on a waiting list. You pick the breeder as carefully as you would pick your breed. Some people say that the self breeds are a good way for newbies to start, as it can teach you alot about colour, condition, type and grooming, but only you can decide whats appropriate for you. There are no really easy breeds so pick something you really like. You’re far more likely to stick it out if you actually like the breed you are doing. Most cavy people are all to happy to discuss their breeds. Grooming is more involved than just a bath and a nail clip. Each breed has its own grooming techniques and requirements which are too extensive to go over here, but it is something you can ask other members about. When you buy your first show cavy, make sure you ask the breeder to give you a lesson on grooming that specific breed. Stewarding is the practice of assisting members to get their cavies on the show table as they will often have more than one in that class and only one pair of hands. Membership is one of the most necessary things in the cavy showing world. As well as allowing you to show your cavies, it also gives you invaluable access to other members and the club library. The club library contains many many books and articles on all things cavy. Some members have been into cavies and exhibiting for most of their lives. They have a lifetime of experience on anything cavy and are only a phone call away. 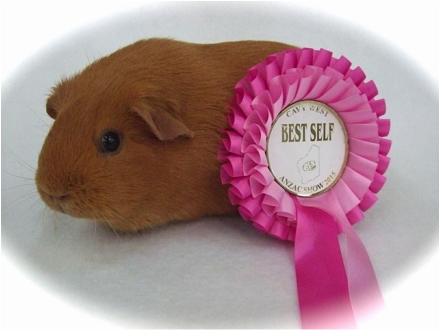 Many members are happy to help you on your journey into cavy breeding and showing too. Membership is as easy as filling out a form and paying an annual membership fee. First you must be a current financial member of a cavy club like Cavy West. Secondly you download and send off a form from the ANCC website to register a prefix. Your prefix is your stud name and all cavies bred by yourself must carry this name. Its a prefix so the beginning of the cavy name starts with it. A stud prefix is registered for life to yourself, is individual and no one else is allowed to have it. Partnerships and families can also own a stud prefix together. Registered simply means that you are registered with the ANCC (Australian National Cavy Council). Need More Info on Showing…. Consider purchasing Matt Gardiners book “Advanced guide to cavy keeping”. Its a great introduction to the world of breeding and showing guinea pigs in Australia. It also has an added bonus of a section explaining colour and coat genetics. Well worth the money!